Outside the Badshahi Mosque, near its steps, lies the Tomb of Allama Iqbal, the poet-philosopher of the East. The mausoleum is a blend of Afghan and Moorish styles of architecture and is constructed entirely of red sandstone which was quarried and brought from Rajasthan. Chhanga Manga is a man-made forest 68 kms from Lahore. There is a lake, and a miniature railway, which winds its way through its forest. Chhanga Manga has 12,510 acres of plantations. It is a popular picnic spot spread over 50 acres with a lake and rowboats, motorboats, children's park, swimming pool, cafeteria, canteen and rest houses. Part of the Jahangir Complex, Asif Khan's Tomb is situated along the western bank of River Ravi opposite the city of Lahore some ten kilometers away. The Complex contains three royal tombs; those of Mughal Emperor Jahangir (d 1627), his wife Nur Jahan (d 1645), and his brother in law Asif Khan (d 1641). Asif Khan served as wazir to the emperor. His tomb was built by the famed emperor Shah Jahan (Jahangir's son), who also built the Taj Mahal, the Juma Masjid, and forts at Agra and Delhi. This low hill over looking Islamabad, known as Damen-eKoh, offers panoramic view of Islamabad. Snack bar facilities are available here. The place is ideal for afternoon and avaning outing with family and friends. Ayub National park is located beyond the old presidency on Jehlum Road. It covers an area of about 2,300 acres and has a playland, lake with boating facility, an aquarium and a garden-restaurant. A very large and interesting private Museum known as Faqirkhana lies inside the Bhatti Gate and is worth visiting. The museum houses a variety of old paintings, including some by great masters, original manuscripts in different languages and artifacts from South East Asia and the Indo-Pak sub-continent. The Kaghan Valley is blocked at the end by high mountains but a pass lets the jeep-able road snake over into the Chilas Valley. This is the 4,173 metres high Babusar Pass which commands the whole Kaghan panorama as well as gives you, on a clear day, glimpses of the Nanga Parbat (The Naked Mountain) glistening at 8, 126 metres. Garam Chashma has an elevation of 1859 meters (6,100 feet). It is 45 km North West of Chitral and takes 3 hours to reach by jeep. Visitors have to take a spectacular drive up the Latbo/Latkho River through deep and narrow gorges to reach this place. This unspoiled enchanting valley of orchards, verdant fields and snow clad peaks is renowned for its boiling Sulphur springs which are famous for healing effect on skin diseases, gout, rheumatism and chronic headaches. For the convenience of tourists "hamams" (baths) have been constructed near the springs. Foreign tourists are requested to pay a toll tax of Rs. 5.00 per person. Bagh-e-Jinnah was formerly known as Lawrence Gardens. It is opposite to Lahore Chamber of Commerce and Industry. It is amongst the biggest gardens of Lahore. Situated besides an earlier course of the Ravi River, Harappa was discovered in 1920-21. The area of Harappa is bigger than Moenjodaro but much to the remains above ground were ravaged by brick-hunters using the material as blast when the railway tracks between Lahore and Multan were laid. However, several cemeteries, which escaped the attention of vandals, have been excavated to reveal the richness and sophistication of its culture. Like Moenjodaro the excavations have revealed a series of cities, stacked one upon another. The site, with its citadel and great granary, seems similar in many ways to Moenjodaro and like its southern sister-city appear to have thrived around 2000 to 1700 B.C. with an economy based largely on agriculture and trade. The Harappan society seems to have been egalitarian, pursuing a rather simple way of life. The cemeteries discovered at Harappa confirm that the Indus Valley people buried their dead, many of them wearing finger rings, necklaces of steatite beads, anklets of paste beads, earnings and shell bangles. Copper mirrors, antimony rods, shell spoons and vessels and urns of various shapes and size lay in the graves. Some of the female skeletons had anklets of tiny beads and girdles studded with semi-precious stones. Excavations have recalled evidence of some pre-Harappan material, which shows strong affinity, with some Kot Diji finds. On display at the Museum is excavated material, including terracotta toys, gamesman, and jewelry, animal figurines, bronze utensils statuettes etc. Harappa and Moenjodaro are two places which form the focal point of tourist attraction. So if you are in Pakistan do'nt miss these historical journeys. You'll be facinated by the displays and exotic archeological finds! Farther east, the Rohi, or Cholistan, is a barren desert tract, bounded on the north and west by the Hakra depression with ruins of old settlements along its high banks; it is still inhabited by nomads. It is at a distance of 30 km. from Bahawalpur. The word 'Cholistan' is derived from the word 'cholna' which means moving. It covers an area of about 16,000 square km and extends into the Thar Desert of India. The region was once watered by the Hakra River, known as the Saravati in vedic times. At one time there were 400 forts in the area and archaeological finds around the Darawar Fort, the only place with a perennial waterhole. The average annual rainfall is only 12 cm, and the little cultivation is made possible by underground wells, drawn up by the camels. The water is stored in troughs, built by the tribes, between sandhills and din waterholes called tobas. The forts here were built at 29 km intervals, which probably served as guard posts for the camel caravan routes. There were three rows of these forts. the first line of forts began from Phulra and ended in Lera, the second from Rukhanpur to Islamgarh, and the third from Bilcaner to Kapoo. They are all in ruins now, and you can see that they were built with double walls of gypsum blocks and mud. Some of them date back to 1000 BC, and were destroyed and rebuilt many times. Cholistan also boasts of many old forts such as Derawar,Vingrot, Banwar, Marcot, Wilhar, Maujgharh, Mao, Phuira and Din-gharh etc. Balakot is located about thirty kilometres from the city of Mansehra, is a town in the North-West Frontier Province of Pakistan. It is a famous tourist destination of the region is one of the first stops for tourists who wish to visit the secluded but beautiful Kaghan valley of the North-West Frontier Province of Pakistan. The river Kunhar runs through the city and is one of the main reasons for the beauty of this area. Balakot is also the main city in this area, and is surrounded by many smaller towns and villages. The Sikhs got a hold of Mansehra in the year 1818 after a stiff resistance from its inhabitants. When the whole Mansehra fell under Sikh control, it was annexed to Punjab. Syed Ahmad Shaheed & Shah Ismail Shaheed with the help of the Mujahadeen, including the Swatis of Balakot and Syeds of Kaghan, led many revolts and attacks against the Sikhs. At last on 6th May 1831 during a fierce battle Syed Ahmad Shaheed & Shah Ismail Shaheed along with hundreds of freedom fighters were martyred. The central mosque of Balakot is named after Syed Ahmed Shaheed. Qazi Khalil Ahmed District Khateeb of District Mansehra,is the present Khateeb of Central Syed Ahmed Shaheed Mosque Balakot. The mosque is destroyed second time by the natural disaster, as it was just reconstructed again after being destroyed by 1992 flood in Balakot. Birmoghlasht has an elevation of 2743 meters (9,900 feet) and is 15 km (9 miles) away. This mountain top towers over the Chitral town and worth visiting in this area is the fairy-tale summer palace of the Mahtar of Chitral (ex-ruler) perched at a height of 2743 meters (9,000 feet). It offers awe-inspiring views of Trichmir and panoramic vistas of the valleys below. The fort is approachable by both a narrow winding road and by foot as well. The quickest method to reach Birmoghlasht would be by foot or alternatively, one can hire a 'local' driver. These local drivers are renowned for maneuvering their vehicles through the narrowest of roads at incredibly high speeds for the road they are traveling on; quite a feat considering that the nearest thing close to the road may be a straight fall to the bottom of a valley or a fast moving, cracking, roaring river. The Park is 28 kms from Lahore. It can be visited by road and by rail. A rail car leaves for Jallo Railway Station every half hour. Spread over an area of 450 acres it has expanses of lawns, a forest research center, a children's park, zoo, a small museum and a gift shop. The tomb of the fourth great Mughal Emperor, Jehangir, lies three miles north-west of Lahore across the River Ravi. It has a majestic structure made of red sand-stone and marble. The outer entrance to the tomb opens out into a court-yard which was used as a caravan Serai during Mughal times. An entrance to the right leads into a Mughal garden with exact geometrical pattern balancing each side. The marble tomb is approached from four corridors leading from the garden. Lake Saiful Muluk has a touch of the unreal about it, nestling 3,200 metres high in the shadow of the Malika Parbat (Queen of the mountains) 5,291 metres high. You can go for boating on the lake and hear the local legend about Prince Saiful Muluk who fell in love with a fairy. Further up are quaint woodland villages; Battakundi, Burawai, Besal Gittidas and Lalazar. The mountain was first surveyed by a European survey team in 1856 headed by Henry Haversham Godwin-Austen. Thomas Montgomerie was the member of the team who designated it "K2" for being the second peak of the Karakoram range. The other peaks were originally named K1, K3, K4 and K5, but were eventually renamed Masherbrum, Broad Peak, Gasherbrum II and Gasherbrum I respectively. The first serious attempt to climb K2 was organized and undertaken in 1902 by Oscar Eckenstein and Aleister Crowley, but after five serious and costly attempts, no member of the team actually reached the summit, possibly due to a combination of questionable physical training, personality conflicts, and poor weather conditions - of 68 days spent on K2 (the then-record for longest time spent at such an altitude) only eight provided clear weather. Subsequent attempts to climb the mountain in 1909, 1934, 1938, 1939 and 1953 also ended in failure. The 1909 expedition, led by Luigi Amedeo, Duke of the Abruzzi, reached an elevation of 6,666 m on what is now known as the Abruzzi Spur (or Abruzzi Ridge). This is considered part of the standard route today; see the route section below. An Italian expedition finally succeeded in ascending to the summit of K2 on July 31, 1954. The expedition was led by Ardito Desio, although the two climbers who actually reached the top were Lino Lacedelli and Achille Compagnoni. The team included a Pakistani member, Colonel Muhammad Ata-ullah. He had been a part of an earlier 1953 American expedition which failed to make the summit because of a storm which killed a key climber, Art Gilkey. On August 9, 1977, 23 years after the Italian expedition, Ichiro Yoshizawa led the second successful ascent to the top; with Ashraf Amman as the first native Pakistani climber. The Japanese expedition ascended through the Abruzzi Spur route traced by the Italians, and used more than 1,500 porters to achieve the goal. 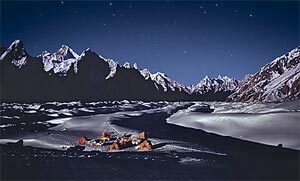 The year 1978 saw the third ascent of K2, via a new route, the long, corniced East Ridge. (The top of the route traversed left across the East Face to avoid a vertical headwall and joined the uppermost part of the Abruzzi route.) This ascent was made by an American team, led by noted mountaineer James Whittaker; the summit party were Louis Reichardt, James Wickwire, John Roskelley, and Rick Ridgeway. Wickwire endured an overnight bivouac about 150 m below the summit, the highest that anyone had spent a night up to that date. This ascent was emotional for the American team, as they saw themselves as completing a task that had been begun by the 1938 team forty years earlier. Another notable Japanese ascent was that of the difficult North Ridge (see route information below), on the Chinese side of the peak, in 1982. A team from the Mountaineering Association of Japan led by Isao Shinkai and Masatsugo Konishi put three members, Naoe Sakashita, Hiroshi Yoshino, and Yukihiro Yanagisawa, on the summit on August 14. However Yanagisawa fell and died on the descent. Four other members of the team achieved the summit the next day. The peak has now been climbed by almost all of its ridges. Although the summit of Everest is at a higher altitude, K2 is considered a more difficult climb, due in part to its terrible weather and comparatively greater height above surrounding terrain. The mountain is believed by many to be the world's most difficult and dangerous climb, hence its nickname "the Savage Mountain." As of August 2004, only 246 people have completed the ascent,compared with 2,238 individuals who have ascended the more popular target of Everest. At least 56 people have died attempting the climb;13 climbers from several expeditions died in 1986 in the K2 Tragedy during a severe storm. Legend once had it that K2 carried a "curse on women." The first woman to reach the summit was Wanda Rutkiewicz, of Poland, in 1986. The next five women to reach the summit are all deceased - three of them died on the way down. Rutkiewicz herself died on Kangchenjunga in 1992. However, the "curse" was broken in 2004 when Edurne Pasaban summitted and descended successfully, and again in 2006 when Nives Meroi of Italy and Yuka Komatsu of Japan became, respectively, the seventh and eighth women to summit K2, both descending successfully. For most of its climbing history, K2 was not usually climbed with bottled oxygen, and small, relatively lightweight teams were the norm.However the 2004 season saw a great increase in the use of oxygen: 28 of 47 summitters used oxygen in that year. 13 miles away from Balakot to Kaghan is Kawai in these 13 miles you'll reach the altitude of 4000 feet starting from 3000 feet which means that you have covered 1000 feet of altitude in just 13 miles. The main place here to visit is Shogran, which is 5 miles jeepable trek now in these 5 miles you'll go up another 3000 feet. Now you are 7000 feet above the sea level and rightly so because Shogran means "Forest in the sky". You'll be able to view the some of the lofty peaks from here which are " Moosa Ka Musalla " and " Makra "having height of 14000 feet, and Malika-e-Parbat (Queen of the Mountains) (17000 feet). Then comes Mahandri village the altitude here is 5,800 feet now the landscape and the scene changes here and becomes wilder the river Mahandri is still with you but you'll feel it much closer to you. Another 11 miles from here is the village Kaghan at 7000 feet is the wonderland here river is 800 feet below the road. The 3118 meter forested pass between Dir and Chitral is normally open to vehicles from June through at least October. It's incredible how the weather beaten road scrambles over it, laboring in wide loops up the Dir side; and then plunging into Chitral in about 50 sphincter tightening switchbacks. It is roughly a 70 km or 3 1/2 hours drive between Dir town and Drosh on the Chitral side. However, don't be mistaken about this short distance. Visitors, for example travelling from Peshawar to Chitral, might have to travel for 14-15 hours before reaching their destination. The summit of Lowari Top is mostly covered in clouds throughout the year. But lucky travellers can experience a breath taking view on both sides on a clear sunny day. There are high winds on the summit at all times which may not be enough to blow you off but are enough to carry away your hats or other small things so hold on tight to them. Upon reaching the summit, the visitor will find a humble stone made hut which acts as a customs checkpost and an adjacent Chai Khana (Tea Stall). In early and late summer you may see gypsy Gujar families on the road with their tents and their belongings. A hole is in the mountainside on the south side is one end of a tunnel meant to go under the summit to make the crossing possible all year round. But there are technical and financial problems and it may never be finished. This beautiful lake/dam is 48 km from Islamabad on Taxila-Haripur Road. It is an ideal place for day trip/picnic, boating, angling and watching migratory birds during winter. Lulu Sar Lake is 48 kilometers away from Naran, on Naran-Babusar road is Lulu Sar Lake which is wreathed in blue and gold wild flowers, and is the main source of river Kunhar. Out side the museum, not far away, Zamzama, the 18th century fire piece immortalized by Kipling as "Kim's Gun", takes up a surprising length of space in the middle of road. Malkandi Forest is 8 miles on the western slopes of Kaghan is Kamalban, a heavily populated forest of black bears and leopards, which do incalculable harm to the crops and young trees. Killing a bear is a big game and you'll get reward for shooting down a bear from forest officer as well as from the peasants. Besides these you'll be able to find Muskdeer, thar and goral, Chikore and Himalayan pheasants all over the valley. And if you'll go a little higher you'll be able to find red bear, snow leopard and ibex and occasionally a snow partridge or Ram Chikore or Murgh-I-Zarrin. The massive walls of Lahore Fort, built by Akbar in the 1560s, tower over the old city of Lahore, and the huge rectangle they define, 380 by 330 meters (1,250 by 1,080 feet), is filled with buildings from a variety of periods. A complete tour of the fort takes about two hours. The entrance to the fort is through Alamgiri Gate The inscription outside the Fort tells that Jehangir built it in 1618. Although the Delhi and Lahori gate bazaars were major processionals, the royal retinue most commonly entered via gates close to the fort. The walled city was the social center of Lahore and the center of its regional culture, but the fort was the political center of Lahore and at least at times the center of its Imperial Mughal culture. It is not until one moves behind the Diwan-i Am-O-Khas and adjacent buildings, that one enters the garden quadrangles of Lahore Fort. At first glance, these courtyards seem to represent yet another garden type. They have limited plantings, and one of them has no plants at all. Some are rectangular, while others have irregular dimensions. The tomb of Shah Rukn-i-Alam grandson of Shaikh Bahauddin Zakaria, which was built between 1320 and 1324, is an unmatched pre-Moghul masterpiece. 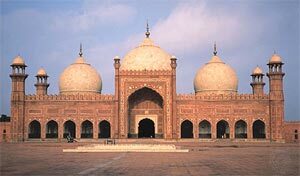 The Mausoleum of Rukn-i-Alam is the glory of Multan. From whichever side the city is approached, the most prominent thing that can be seen from miles all around is a huge dome. This dome is the Shrine of Sheikh Rukn-ud-Din Abul Fath commonly known by the title Rukn-i-Alam (pillar of the world). The tomb is located on the southwest side of the Fort premises. This elegant building is an octagon, 51 feet 9 inches in diameter internally, with walls 41 feet 4 inches high and 13 feet 3 inches thick, supported at the angles by sloping towers. Over this is a smaller octagon 25 feet 8 inches, on the exterior side, and 26 feet 10 inches high, leaving a narrow passage all round the top of the lower storey for the Moazzan, or public caller to prayers. The whole is surmounted by hemispherical dome of 58 feet external diameter. The total height of the building, including a plinth of 3 feet, is 100 feet. As it stands on the high ground, the total height above the road level is 150 feet. Besides its religious importance, the mausoleum is also of considerable archaeological value as its dome is reputed to be the second largest in the world after 'Gol Gumbad' of Bijapur (India), which is the largest. The mausoleum is built entirely of red brick, bounded with beams of Shisham wood, which have now turned black after so many centuries. The whole of the exterior is elaborately ornamented with glazed tile panels, stringcourses and battlements. Colors used are dark blue, azure, and white, contrasted with the deep red of the finely polished bricks. The tomb was said to have been built by Ghias-ud-Din Tughlak for himself, but was given up by his son Muhammad Tughlak in favor of Rukn-i-Alam, when he passed away from this world during 1330 AD. This museum was established during the British Raj in 1864. It displays a complete cross-section of the Culture and History of the region with rare and best collection of the Buddhist art from the Gandhara Period, Islamic artifacts, Calligraphy, Old Manuscripts, Arms, Costumes and Jewelry. Minar-e-Pakisan is a new landmark in Lahore and stands in the Iqbal Park to commemorate the date when a resolution was passed there back in 1940 demanding the creation of a separate homeland for the Muslims of this Sub-Continent. The Minar is a blend of Mughal and modern architecture and stands 60 meters tall. Located in the heart of the town and set in modern style is the Lahore zoo founded in 1872. It is one of the oldest Zoos in the sub continent. The material used in some of the construction even bears the marks of 1853. The Lahore zoo attracts a large crowd throughout the year. Driving along the Sharah-e-Quaid-e-Azam, just ahead of the charring cross and opposite to the WAPDA House is the main gate of the Zoo. Misriot dam is located 12 km southwest of Rawalpindi. This small dam has an artificial lake with boating and fishing facilities. Fishing permit may be obtained from fishing guard at Misriot. It has a pleasant landscape and walkways beyond the lake among eruptions of black rocks. Another popular park of Lahore city is Model Town Park. The park has a beautiful pond with a fountain in the middle that shoots water high into the air. Many benches surround the pond where people can sit and watch water fowl. The trees are well maintained and a path runs through the length of the park to a huge play area well equipped with monkey bars, slides, swings, tunnels, and swinging bridges. The entire park is wheelchair accessible. Situated near Ayub National Park, Rawalpindi Golf Course was completed in 1926 by Rawalpindi Golf Club, one of the oldest golf clubs of Pakistan, founded on 2nd November 1885. The facility was initially developed as a nine-hole course. After several phases of development, it is now converted into a 27-hole course. The club is being patronized by the successive Presidents of Pakistan. Mohra Sharif (Holy Village; Mohra for "small village" and Sharif for "holy" or "noble") is an isolated mountain monastery and home of the Naqshbandia Mujaddadiya Qasimiya-Nazeeriya Sufi Islamic Order also known as Nisbat-e-Rasooli (meaning Relation to the Prophet), located in the Murree hills of Punjab, Pakistan. Rawalpindi Public Park is located on Murree Road near Shamsabad. The Park was opened for public in 1991. It has a play-land for for children, grassy lawns, fountains and flower beds. A cricket stadium was built in 1992 just opposite the Public Park. The 1992 World Cup Cricket matches were held on this cricket ground. The stadium is equipped with all modern facilities. Situated at Poonch house, Multan Road, Lahore it was established in 1950. This is an Industrial and commercial Museum, which is meant to depict country's economic resources both in the form of raw products and worked objects. Its collection is arranged in one gallery and one large hall of the building. The main hall displays a range of variety of material such as well plated musical instruments, table lamps of camel skin from Multan and Bhawalpur, cotton, silken-woolen and embroidered textiles from all important cites of Pakistan. Swat river in northern Pakistan, formed by the junction of the Gabriāl and Ushu rivers at Kālām in the Kohistān region. Fed by melting snow and glaciers and receiving the drainage of the entire Swāt River valley, the river flows southward, then westward, until joined by the Panjkora River. The united stream then flows southwestward into the Peshāwar Plain and joins the Kābul River at Nisatta after a 200-mile (320-kilometre) course. The Swāt canals irrigate about 160,000 acres (65,000 hectares) in which sugarcane and wheat are the chief crops. Multan Fort was built on a detached, rather high mound of earth separated from the city by the bed of an old branch of River Ravi. There is no Fort now as it was destroyed by the British Garrison, which was stationed there for a long time but the entire site is known as the Fort. Nobody knows when Multan Fort came into being but it was there and it was admired and desired by kings and emperors throughout centuries. It was considered as one of the best forts of the sub-continent from the defence as well as architectural points of view. When intact its circumference was 6,600 feet or, say, about one and a half mile. It had 46 bastions including two flanking towers at each of the four gates named as the De, Sikki, Hareri and Khizri Gate. When it was intact the Fort consisted of a hexagonal wall from forty to seventy feet high, the longest side of which faced the northwest and extended for 600 yards, and which isolated it from the town. A ditch twenty-five feet deep and forty feet wide was on the side of the wall, behind which was a glacis exhibiting a face of some eighteen feet high, and so thick as to present an almost impregnable rocky mound. Within the fort, stood the citadel. The walls were flanked by thirty towers, and enclosed numerous houses, mosques, a Hindu temple of high antiquity, and a Khan's palace, the beauty of which was severely damaged by the battering it got from the guns of Ranjeet Singh in 1818. Once this was the position of the Multan Fort, but during the British occupation everything was lost and finished forever. This 20,360 sq.meters rose garden is famous for its roses. It has 250 different varieties of roses as well as a dozen types of Jasmines. Flower shows are occasionally held here, particularly during spring. Nearby is the Tourist Camping Site. Nanga Parbat (also known as Nangaparbat Peak or Diamir) is the ninth highest mountain on Earth and the second highest in Pakistan. Nanga Parbat means "Naked Mountain" in Urdu/Hindi, parbat deriving from parvata "mountain". Nanga Parbat was one of the deadliest of the eight-thousanders in the first half of the twentieth century; since that time it has been less so, though still an extremely serious climb. It is also an immense, dramatic peak, with great local relief. The largest district of the Northern Areas, Baltistan is home to some of the highest peaks in the world, the Karakoram Range, and is very popular with Mountaineering Expeditions. It is equally popular with high altitude trekkers, with treks to Baltoro Glacier, K-2 Base Camp and Concordia being especially renowned. The major city in Baltistan is Skardu which by road, lies approximately 5 hours away from Gilgit. A daily flight to and from Islamabad is also in operation. The PTDC Motel overlooking the Mighty Indus is located in the heart of the city at a breath-taking location. The comfortable rooms and a fine restaurant make the stay at this motel memorable. In addition, Rent-a-Jeep, Satellite TV, Fax and Curio Shop facilities are available on the premises. Places of interest in and around Skardu include Shigar, Kherpachuo Fort, Satpara and Kachura Lakes, famous for deep blue waters and brown trout making them an anglers delight. Visit to Deosai plains is an experience of a lifetime. The Empress Nur Jehan, "Light of the World", was the only empress whose name appeared on the coins of the Mughal empire. She was buried in 1845 AD at Shahdara (Lahore) outside Jehangir's mausoleum across the railway line. Shakarparian hills are situated near Zero Point, at a height of 6009 meters. Its terraced garden offers pleasant and sweeping vistas of Margalla and Murree hills, Rawal Lake, Rawalpindi and Islamabad. Snack Bar facilities are available. This museum was actually Shakir's House at 93, Tipu Block, New Garder Town, Lahore, which he made for himself. After his death it was bought by Idara-I-Saqafat-e-Pakistan and formally turned into a museum on April 3rd, 1976. The idea behind it was not only to preserve the great artist's paintings and other masterpieces under one roof but also to open this combination of modern and traditional archietecture to the public. This glistening man-made lake covers an area of 8.8 sq. km. The terraced garden and the lake are ideal for picnic, fishing and boating. The highest point in the garden commands a panoramic view of the lake, Margalla and Murree hills, Rawalpindi and Islamabad. Three miles east of Lahore are the famous Shalimar Gardens laid out by the Mughal emperor Shah Jehan in 1642 AD. The Gardens are spread out in typical Mughal style and are surrounded by high walls with watch towers at the four corners. Originally, the gardens were spread over seven ascending terraces, but only three remain now, which cover an area of about 42 acres. The Khizri Gate or Sheranwala Gate is located within Walled City of Lahore in Lahore, Punjab, Pakistan. Shairanwala Gate is one of the four gates which once opened on the river front north of the Walled City. It was named after Khawaja Khizr, the patron saint of running waters and rivers. The Gate & its neighbourhood were so named because there was a ferry on the River Ravi in front of it. It is also known as Sheranwala Darwaza, because Ranjit Singh is said to have kept two lions in cages in front of this gate. The Italian traveller Niccola Mannuchi, who visited Lahore in 1667, has named it as Qadri Gate but gives no reason for this. The Imperial or the Badshahi Mosque is across the courtyard from Alamgiri Gate of the Lahore Fort. The Mosque, which is made up entirely of red sandstone was built by Emperor Aurangzeb, the last of the great Mughals, in a record time of two and-a-half years. Its construction was completed by 1674 AD. It has a beautiful gate-way which measures 21.33 metres in length and a courtyard that measures 161.5 x 160.6 metres and is said to be the largest mosque courtyard in the world for outdoor prayers. The marble domes cover seven prayer chambers. Four lofty minarets stand at the four corners of the mosque, each with an outer circumference of 20 metres, soaring up to 54 meters. The shrine of this renowned saint of Lahore (d. 1071 C.E. ), is close to the junction of the Lower Mall and the Circular Road. Data Sahib was a great Sufi saint whose well-known work, "Kashf-ul-Mahjub" has been translated from original Persian into several European languages and is considered a classic. His grave is surrounded by a beautiful mosque. In the courtyard near Jehangir tomb lies buried his brother-in-law, Asif Khan, father of Shah Jehan's beloved Queen Arjumand Bano. He lies in a tomb that today shows little of its former splendor. In front of the Punjab Assembly Hall stands a sleek column known as the Summit Minar. This was erected in distinction of staging the second Islamic Summit in 1974.